The Nike Lunarglide 7 is the latest model in the Lunarglide series. The newest model has additional features to improve your workout performance. It uses high technologies to ensure you don’t face problems while running. You can read the Nike Lunarglide 7 Review for all the details. If you need a lightweight shoe that offers excellent support, this model is one of the best choices. Extra cushioning and breathability, ensures you enjoy each step when running. Also, this shoe offers an enormous amount of support. It is good for those with medium and high arches. 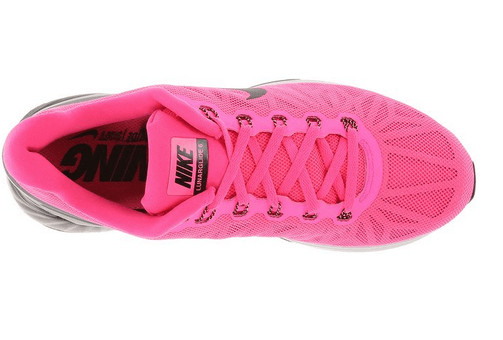 Is this running shoe perfect for you? After reading this in-depth review, you will have a good answer. Lunarlon foam offers a cushy feel. Allover 3M reflection and water repellency upper. Newly upgraded for a stellar experience mile after glorious mile. Beautiful upper appearance and more than ten color blends. This shoes upper section has an open mesh that offers better breathability. This open mesh ensures that your foot remains dry and cool for the entire run. It has Dynamic Flywire that covers the length of your foot. This technology offers lightweight support allowing you to run for long distances. The Lunarglide 7 features Strobel Last in the upper, which run the full-length Phylon. This feature provides a cozy underfoot feel as well as better cushioning. This shoe helps to reduce overpronation through the Dynamic support. 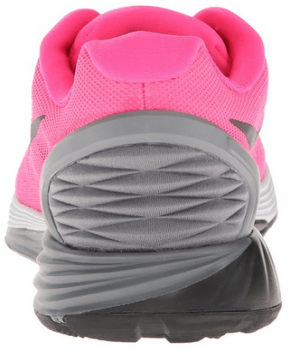 This feature combines Lunarlon foam and Phylon carrier to produce a denser medial midsole. Also, this feature offers extra cushioning for fine shock absorption. It has a gender-specific crash pad at the bottom of the heel that helps correct overpronation. Also, this feature helps reduce shock impact when your foot hits the ground. Unlike its predecessor, the Lunarglide 7 midsole conforms to your foot shape. Thus, you underfoot will be cozy when running. The outer of this shoe has BRS 1000, a rubber material that offers durable traction. This material ensures that you won’t experience problems while running. Such as slipping on the ground. Note that the traction of a running shoe is vital if you want to avoid accidents. It has gender-specific Flex Grooves for improved flexibility. You will move your foot without restrictions. Also, this feature improves the efficiency of the transition from heel to toe. 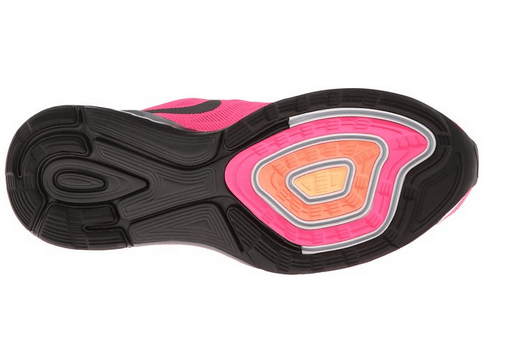 Also, this shoe has Pressure-Mapped Outsole, which promotes natural motion. If you have a medium-sized heel, mid-foot or forefoot, you can wear this shoe. This shoe is a great fit for people in this bracket. 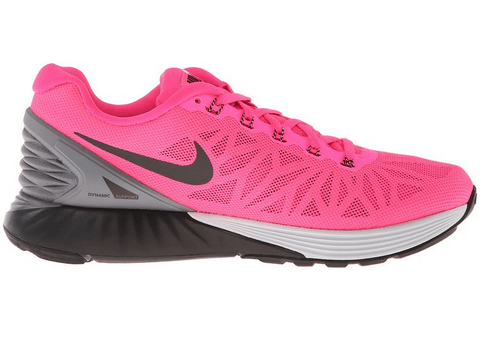 You are sure that your feet will feel cozy while running with the Lunarglide 7. However, if you have wide feet, this shoe is not a good choice. Regarding the shoe size, it adheres to the standard running shoe length. Hence, to get a perfect fit, simply choose your actual foot size. Unlike other shoes, you don’t have to buy half smaller or bigger size than your normal foot size. It’s a arch support shoe that serves the needs of runners with high or medium arches. Additionally, this shoe reduces moderate overpronation. If you are a flat foot runner, you won’t experience the dangers of overpronation. This shoe features lightweight materials for stability. The Lunarlon foam features a soft inner core but has strong outer layer wrap that enhances stability. Also, the deeper heel section provides solid performance and stability. Thus, with the Nike Lunarglide 7, you will enjoy better arch support. The men’s version weighs only 272 grams while the women’s version weighs 221 grams. The lightweight design ensures unbeatable stability. However, some stability shoes are heavy due to their cushioning systems. However, with the Lunarglide 7, the weight is not an issue. A high heel to toe drop. Q. Does it have enough heel cushion? A. Yes, this shoe has adequate heel cushion. Q. How long can this shoe last? Years? A. They are highly durable. However, the usage and running style affect the durability. The Lunarglide is continually improving each model. 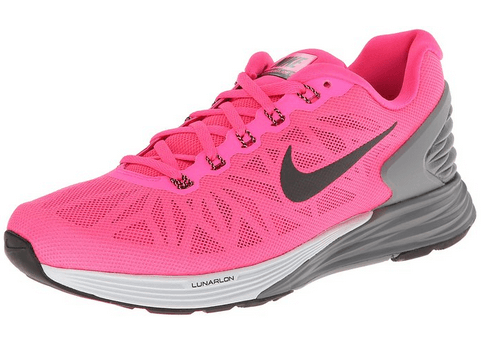 The Lunarglide 7 is an improvement of the Lunarglide 6. This shoe is lightweight, has an extra cushion, better breathability, and a beautiful appearance. It offers a blend of stability and smooth ride for flat footed runners. The design includes Flyknit and Flywire for personalized fit and comfort. If you are a flat-footed man or woman, this shoe will improve your performance in running. Thanks for your opinion. We will think about it in future.